It’s always fascinating to read about someone else’s obsession with a particular dish. 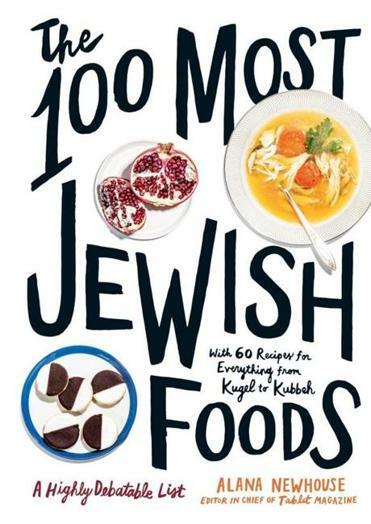 In “The 100 Most Jewish Foods” the writers aren’t necessarily fanatical about their subjects. Some aren’t even Jewish and haven’t been raised on these foods. So their take is even more interesting. Celebrity chef Marcus Samuelsson weighs in on eating cured salmon (lox) in Sweden as a boy; Eric Ripert of Le Bernardin declares that gefilte fish is “not as bad as it’s made out to be;” and Amanda Hesser and Merrill Stubbs of Food52 regret that instead of brisket for their childhood meals, they got pot roast. Alana Newhouse, editor of the online Jewish magazine Tablet, who compiled the essays and recipes, turned to New York restaurateur Dan Barber for an essay on apples; he writes from the perspective of the apple after the story of Adam and Eve. Novelist and critic Daphne Merkin reveals that cheesecake is “best served on Shabbos morning as a padding for the several hours of shul-going ahead.” Newhouse, whose ancestors came from the region that is now Macedonia, describes how her grandmother made huevos haminados (Sephardic 7-hour eggs), with Chock full o’Nuts coffee grounds, used tea bags, and discarded onion skins in the water to color the shells. Some obscure dishes that are well worth knowing include flodni, based on an ancient confection popularized in 19th century Hungary. It’s layered with pastry, poppy seed spread, apples, walnuts, and plum jam. Carciofi alla Giudia, fried artichokes from Rome’s Jewish quarter, are deep-fried using thorn-free cimaroli artichokes. There is kubbeh (also called kibbeh), meat-filled dumpllings well-known in Iraqi, Kurdish, and Middle Eastern Jewish households. Also here is a Sephardic dish made in communities from Turkey to Egypt called mina de matzo, which is like lasagna, but layered with softened matzo sheets, meat sauce, tomato sauce, and Swiss chard. Dairy versions with cheese, greens, and eggs abound, as do layers with eggplant or lamb. There are discussions on half-sour pickles, black-and-white cookies, matzo brei, Hydrox cookies, and stuffed cabbage. What’s fun is all the other stuff you might not know.